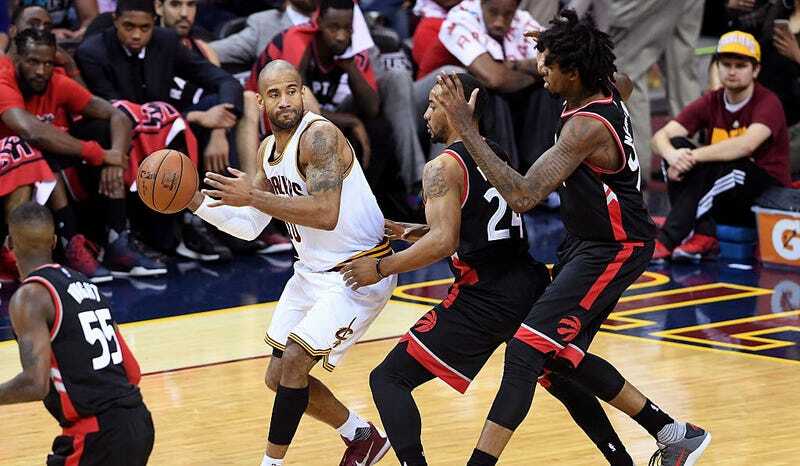 The NBA suspended Dahntay Jones one game “without pay” for whacking Bismack Biyombo in the groin late in Game 3, and while the Cavs might miss the 1.9 minutes per game they’ve gotten from Jones (unlikely), Jones won’t actually miss his game check all that much. Jones, however, has one of the smallest full-season salaries on record. The Cavs signed the 35-year-old as roster depth/insurance for their postseason, and they signed him just before the regular-season finale, so he technically played only one game. He made the veteran minimum, prorated for just that last game out of 82—or about $8,800. And 1/110th of that full-season salary of $8,800 means his one-game playoff suspension will cost him 80 measly smackers. Jones will make some money for his efforts this postseason. The NBA funds a “Player Playoff Pool” from its postseason gate receipts, and distributes it to all playoff teams—with more money going to the teams that go deeper. Teams can divvy up their share any way they like, but the Warriors’ share last season averaged out to roughly $250,000 per player. So Jones isn’t working for free. Oh, hey, things are really looking up for Jones’s bank account: LeBron James said he’ll pay his teammate’s $80 fine.